This is a study guide for the book All the King's Men written by Robert Penn Warren. All the King's Men is a novel by Robert Penn Warren first published in 1946. Its title is drawn from the nursery rhyme Humpty Dumpty. 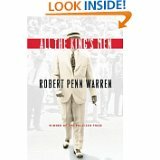 In 1947 Warren won the Pulitzer Prize for All the King's Men. Please click on the literary analysis category you wish to be displayed.